One big advantage of a secondary fermentation is that it reduces the sugar without sacrificing the taste. Most folks do a Second Stage to increase carbonation. But be aware this will also increase the alcohol content as well. The aerobic kombucha ferment results in only about 0.5% alcohol, but with an anaerobic ferment and anaerobic yeasts the bottled kombucha goes up to around 2% alcohol. (beer is around 4%, and wine 7%) . The alcohol content for Kombucha or your favorite Probiotic Ferment (Water Crystals, Ginger Beer Plant, Jun) cn go higher depending upon the type of yeasts. A Champange-type yeast may g as high as 20%. The typical Kombucha Probiotic Drink under a Second Stage Ferment typically only goes to 2%. Since brewing kombucha and studying its character I have run across many "correct preparations" and "original methods" therefore first I want to describe the basic Kombucha Tea brewing guidelines as I understand them. Typically apple-cider vinegar is 5 % acetic acid while Kombucha Tea < 1%. The difference between vinegar and kombucha is gluconic acid. The gluconic acid is produced by Acetobacter xylinum; Gluconacetobacter. Recently a species specific to kombucha has been identified and is undergoing recognition as Gluconacetobacter kombuchae. As is a similar yeast strain Zygosaccharomyces kombuchaensis. You may or may not have these pure bred bacteria or yeasts and typically for a home ferment they do not matter. They matter more in the bottling stage. During bottling anaerobic yeasts and anaerobic bacteria, like, S. Boulardii and lactobacillus otherwise considered healthy and beneficial continue to ferment creating additional acids, lactic acid, carbonation and alcohol. Generally the more carbonation the more alcohol in the bottle. The yeasts in the Kombucha SCOBY are primarily of the aerobic yeasts; Saccharomycodes ludwigii, s. apiculatus, Schizosaccharomyces pombe, Zygosaccharomyes, Saccharomyces Boulardii, while these are anaerobic yeasts which produce higher levels of alcohol under anaerobic (no oxygen) conditions such as with an air-lock, Torulaspora delbrueckii is unique as the only aerobic yeast. Producing alcohol only under oxygen (aerobic) conditions. Brian Nummer in his article on Kombucha Brewing under the FDA Food Model recommended a yeast that would ferment at low temperatures (40-60F range to avoid yeast producing more alcohol when bottled and only slightly chilled) T. delbrueckii has a range of 60-68F, although this is lower than the typical Saccharomyces species (71-77F), IMO, side by side bottling and storing at >60F Saccharomyces produced much more carbonation which is an indication of higher alcohol levels as well. My personal preference for low alcohol remains with T. delbrueckii , racked - not filtered - before bottling and stored at < 60F. The bottling should be sterilized beforehand, but the ferment if chilled before bottling will retain more of its carbonation. note: the FDA and local regulations may require higher temperatures. Saccharomyces cerevisiae, found in bread, beers, wines and other ferments abound in the air and therefore are also typically present. This combination of bacteria and yeasts work in an oxygen environment. What is referred to here as an aerobic fermentation. Over-simplified the yeasts cleave the sugar into glucose and fructose. The yeasts produce alcohol from the glucose which the gluconacebacter than convert to acetic acid. Both the yeast and the gluconacebacter compete for the glucose which the bacteria convert to gluconic acid. In the typical kombucha ferment (9 days at 80F/26C) very little alcohol remains (less than 1/2 of 1%). The Kombucha Tea has gone from really sweet tea to a pleasant semi-sweet state. One needs to harvest before the ferment goes to vinegar. *It is had to accurately know how much sugar or fructose remains. Cornell Study indicated 5% (4.8 g/L) glucose after their typical 9 day ferment (pH 2.5). Their initial sugar start was 100 g/L. If we wish to bottle and refrigerate our brew will stay pretty much as it is with a slight more mellowness. [Cold Stabilization]. To maintain this character we simply have to bottle without leaving any air space. The bacteria will continue to convert the alcohol to acetic acid (becoming increasingly more sour) and compete with the yeasts for the remaining glucose as long as there is oxygen in the bottle and temperatures are in the range of 55F-85F. The yeasts will remain active as long as glucose and oxygen is present. Anaerobic yeasts switch to an anaerobic (without oxygen) ferment when oxygen is no longer available and temperatures are above 40F / 5C. The yeasts also produce carbon dioxide (carbonation) which suffocates/diminishes the bacteria. One effect may be more alcohol but no additional gluconic acid will be created as the gluconacebacter rely upon oxygen. Yeast may produce additional acetic acid. lactobacillus if present will continue to produce lactic acid, acetic acid and alcohol as well as some carbonation depending upon its species. The effort here are to reduce the sugar content creating a 'drier" Kombucha Tea. Of course the opposite is true if wishing to increase the alcohol level. a) the Yeast go from Respiration, reproduction and creating more yeasts and more carbonation, to Fermentation, creating more alcohol and less carbonation and less yeast population. Reducing the sugar. Yeast leave a brown sludge (flocculation) as the yeast cells die off. i. T. delbrueckii is the only exception as it goes dormant as the oxygen dwindles. c) The Lactobacillus species of bacteria (not present in all Kombucha, but gaining in popularity) They will be active over 60F. with or without oxygen. Feed off the sugar. The heterofermentative species will produce lactic acid, acetic acid, alcohol and carbonation but mainly lactic acid. The homofermentative species will produce only lactic acid. These tends to sour the brew. It also balances the harsher acetic acid produced by the Acetobacter. Lactobacillus population will increase as the yeast population decline. Feed off the dead dying yeast cells. Lactobacillus will leave a white sludge. They may also produce a biofilm (mushroom) in the bottle. It is the best practice to measure your remaining sugar and potential alcohol levels with a Hydrometer. This should have been done when you first started your ferment. That way you know how far you've gone, and that there is some fermentable sugar left.still measure and write down the SG. First you may want to Proof your ferment. To “proof” slowly warm up a cup of your ferment to about 100F. Add a tsp of sugar and wait 10 minutes or so to see if it bubbles or turns frothy. If it bubbles, you have "proof" that your yeast is alive and can continue. If not and your hydrometer reads there are fermentable sugars then the pH is too low and add some calcium. (pH of 4-5) Consider adding some new yeasts and sugars as desired. Or shake up the ferment to add oxygen. You may want to filter your ferment before starting a Second Ferment. One easy filter is simple cheesecloth folded over a few times and run a hot iron over it to sterilize it. Filter will remove most of the sludge (referred to as "squidles") and a percentage of the yeasts. Bacteria are smaller. Filtering also re-introduces oxygen to the ferment and restarts the yeasts. If you RACK. Siphon instead you avoid restarting the yeasts. 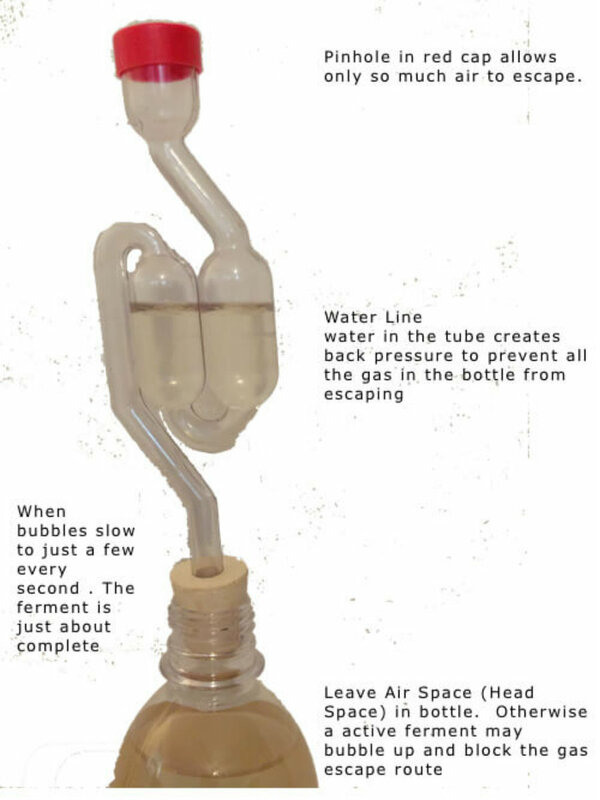 Siphon is usually used after your fermentation is complete and you want to bottle. The question here is how much oxygen do you want to add to your ferment. The more oxygen the greater the yeast population, the greater the alcohol and carbonation and the less the sugar. And the more the sediment in the bottle. Another reason is to reduce the sugar content as much as possible for diabetic and other health concerns like Candidiasis. The first stage of fermentation as outlined above should produce a semi-sweet tasty Kombucha Tea. There should be some sharpness or sourness, not so much as to make it undrinkable, nor too sweet. If you are checking the pH it should be from 2.5 to 3.5. (2.5 - 4.2 according to Brian Nummers, < 4.0 according to State of Minn Pickle Bill). The pH is not always absolute in determining taste or total acids. For example Apple Cider Vinegar has a pH of 3.0 with 5% acetic acid But not drinkable. You can sip it but not drink it like a cup of Kombucha Tea - which could have a pH of 2.5 and less than 1% acetic acid! You may also find that the pH bounces back up ! Or doesn't go lower despite longer time. One reason may be autolysis, where the yeasts or LAB are scavenging the dead and dying yeast cells. This alters the chemistry. You can measure the Total Acids with home test kits or a DIY Red Cabbage Test. When bottled and expected to store for some time then it is extremely important that the pH be under 4.0. You should measure the pH just before bottling and only after any flavors, sugars etc has been added. If your ferment is already pretty much vinegar - its too late. Use it as a hair rinse, foot bath, or a body wash for pets and animals. Or mix with sparkling water or fruit juice and drink. Or add to Honey creating what the Romans referred to as Oxymel. Hippocrates, father of modern medicine, cited this as a home remedy for many disorders. Now find a nice clean glass bottle and an air-lock. An Air-Lock, With the airlock you determine when the fermentation is complete by the numbers of bubbles (or lack of bubbles) that flow through. With the balloon its largely a guess and hopefully before the balloon pops. The warmer the ferment the faster the fermentation. Bubbles or gas will continue to be produced as long as there is fermentable sugar available. If your desire is to create a higher alcohol content a la Kombucha Wine add additional sugar (glucose or dextrose) just prior to the air lock or balloon. Adding sweet fruit syrups for flavoring to increase the alcohol potential and taste. Adding fructose at this point will mainly increase the sweetness without adding additional fermentation or potential alcohol if the Second Stage ferment is kept very short (fructose is fermented last). Shaking the bottle and stirring up the ferment adds oxygen which will add both more carbonation and more alcohol. Taking the Specific Gravity (SG) reading via a Hydrometer before the ferment begins and when ready to harvest will reveal the potential sugar remaining and the potential alcohol. You can/should be taking these readings often during both stages of your ferments. Just realize that in the First Stage (regular kombucha brewing) the "potential alcohol" will not be achieved because the Acetobacter will be busy converting the alcohol to acetic acid. That conversion may be as high as 1:1. One percent alcohol converted to one percent acetic acid. The Sugar is converted at just less than 1:1. One percent sugar to one percent alcohol. 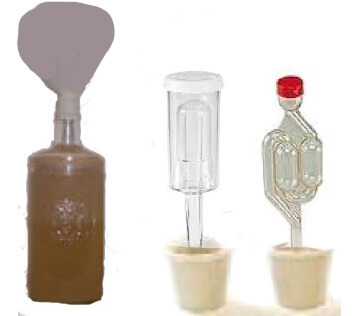 Therefore the Second Stage Ferment, principle anaerobic (without oxygen and without the co-operation of the Acetobacter) the SG - reading potential alcohol may be achievable. EXCEPT if the pH of the brew is too low, resulting in no or very little additional fermenting. Adding different yeast or higher alcohol producing yeasts and babying them with nutrients and pH adjustments (like calcium) may be necessary to achieve higher alcohol levels. Another main reason for a Second Stage Ferment is to add Medicinal Herbs and Spices. Refer to our article on Adding Medicinal Herbs and Spices or Harald Tietze Kombucha Teaology. It is also good to know that Kombucha in a second ferment will produce more alcohol. The more carbonation the more the alcohol. Many folks claim that Kombucha Tea is Alcohol Free. Since the alcohol that is produced by the yeasts is converted to acetic acid by the bacteria. True, in the primary aerobic ferment in the presence of oxygen the gluconobacter does convert alcohol to acetic acid at almost a 1:1 ratio. That takes time and eventually would produce a non-alcohol kombucha tea into a vinegar. Where we like it at least semi-sweet some alcohol remains, believed to be less than 1/2 of 1%. Pretty low. Comparable to day old fresh squeezed juice. When bottled and capped, the oxygen is cut off, basically ending the exchange into acetic acid. Yet the yeast are still active, more so, and produce greater amounts of alcohol. Apparently that is what got Lucy Lohan in trouble after her drunk driving charges. Lucy plead ignorance. The TTB and FDA however did investigate and led to a voluntary recall of Kombucha Tea off the retail store shelves. see my article on How Much Alcohol is there in Water Kefir. 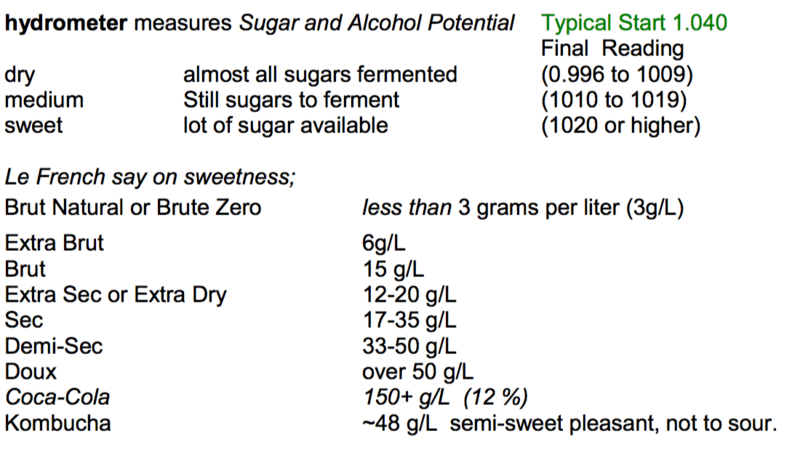 You may be able to guess how much alcohol is in your ferment by measuring the sugar and acid levels. If you take the beginning sugar level (either via a Hydrometer or a Brix) and the ending sugar levels would equal remaining sugar level and calculate the total acidity (see testing acidity). Then minus the total acidity from the remaining sugar should equal remaining alcohol. The trouble here is you're trying to measure a very low percentage and the percentage of error is greater than 1%. 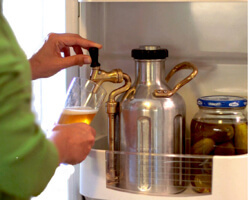 You can enjoy and drink away, bottle for latter or further clarify and refine your ferment. You can bottle in most anything that has a sealable cap. But be cautious with glass bottles that may explode. Plastic water bottles can withstand 600 pounds of pressure and you can see and feel how much pressure there is before opening. Even if Glass Bottles don't break there may be lots of pressure inside an dmay well shoot all over, make a huge mess and waste your fortune. Bottles should be chilled before opening to reduce risks. Cold keeps the Carbonation in the liquid and is more enjoyable that shot in the air and wasted. If you use glass I recommend using at least one one plastic bottle as a "canary" That way you can see and feel how much pressure your brew is at and judge the other bottles accordingly and move to the refrigerator. Grolsch Beer Bottle actually come with beer inside. So buy a case an invite your friends. Or avoid the cleanup and mess after and buy a case of the bottles from us. 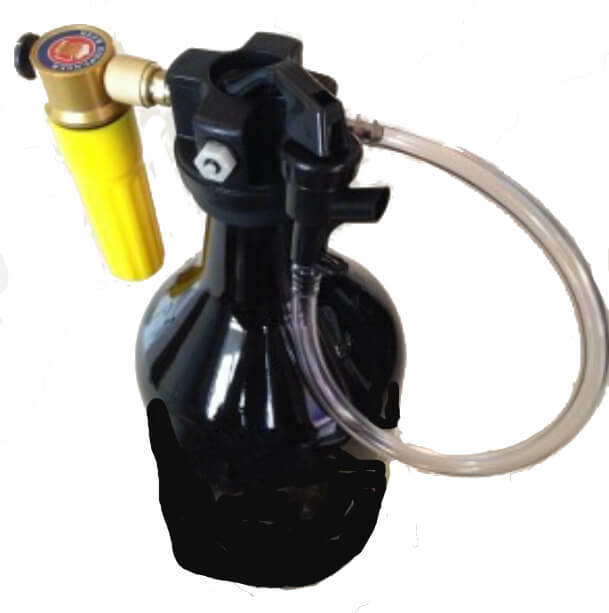 Since the advent of Micro-Breweries refillable "growlers" have come of age. No longer are the kegs large, bulky and expensive. Herald the arrival of man's second best friend. The easiest and quickest method to get and keep Fresh and Bubbly, Carbonated just the way you like it Kombucha on Tap.